Nasir Husain created magic on screen with his enigmatic work from the 1950s to the 1980s. From Yaadon Ki Baaraat to Tumsa Nahin Dekha, the master entertainer captured audiences and reinvented cinema. In award-winning author Akshay Manwani’s book Music Masti Modernity – The Cinema of Nasir Husain, the author, through interviews and insightful inputs from Bollywood’s noted names, examines what went into making him a great director. 1. What made you trace Nasir Husain’s journey? I grew up on Nasir Husain’s films, particularly films like Yaadon Ki Baaraat (1973), Hum Kisise Kum Naheen (1977) and Jo Jeeta Wohi Sikander (1992). I felt that the legacy of the man, who had given us such good films over four decades, hadn’t been given its full due. I wanted to rectify that and place Husain among the great film-makers who have enriched Hindi cinema. 2. What has the creative journey been like? Any interesting anecdotes you can recollect? From researching to meeting various film personalities to discovering some long-forgotten Hindi films, it was all very gratifying. I remember the time I travelled to Coonoor to meet Mansoor Khan, Nasir Husain’s son and the man who directed Qayamat Se Qayamat Tak (1988). One evening, after we had eaten our dinner and had to go drop a guest of his to another resort, our car fell into a ditch. While trying to retrieve the car, Mansoor kept telling us that leopards and other wild animal frequent these areas. It was quite scary actually. 3. What do you like the most in Nasir Husain’s works? The best thing about Husain’s films is the sheer joy and the emphasis on youth. His films exude a certain comfort with cosmopolitanism and Western modernity. He wasn’t a film-maker who passed judgement on Western influences in cinema. On the contrary, there was a celebration of the club culture in his films. 4. What did you hope readers would take away from the book? I hope readers look at Husain’s films, at his cinematic craft in a new light. I have tried to explain how he was such a good dialogue-writer, of how his vocabulary evolved with the times. And all the very many great song sequences that were there in his films, he put great effort and thought into them. His cinema may have been candy floss, but there was a lot of work and craft that went into it. 5. Your thoughts on winning Verve‘s Storytellers book award…. To be rewarded and acknowledged is great encouragement. I sincerely thank Verve for the award. Moreover, to be nominated among writers like Jerry Pinto, Siddhartha Mukherjee and Akshaya Mukul is a huge honour and for me, that was like an achievement in itself. 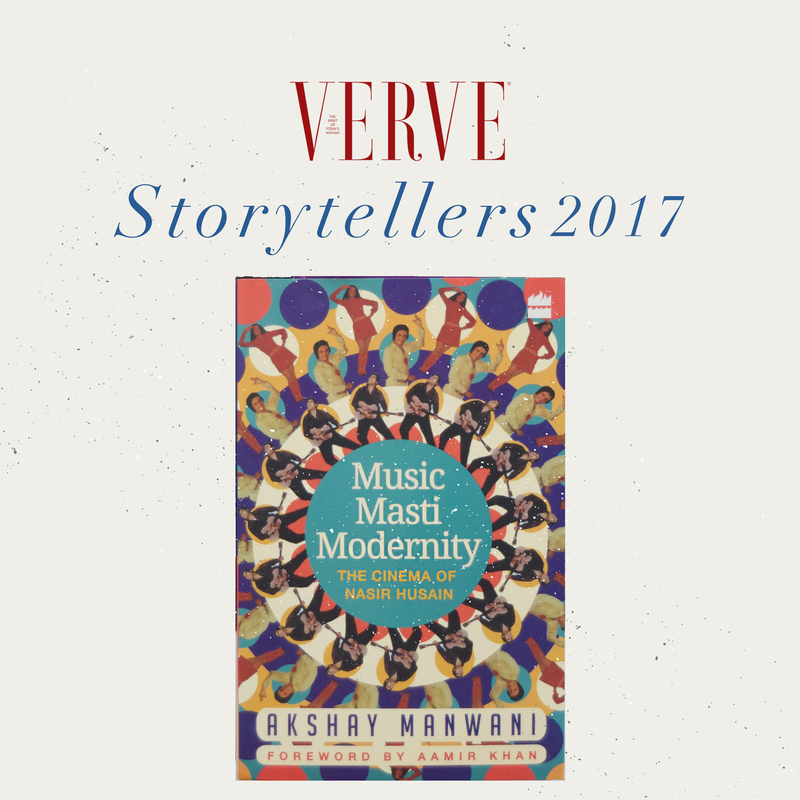 ‘Verve Storytellers’ book award highlights the best in Indian storytelling. This is it’s second year. The long-list and shortlist of the nominees were curated by Verve’s editorial team along with the editor of the Indian Quarterly, Madhu Jain. The winner was decided on the basis of our readers’ inputs via an online poll run on Verve‘s social media platforms.